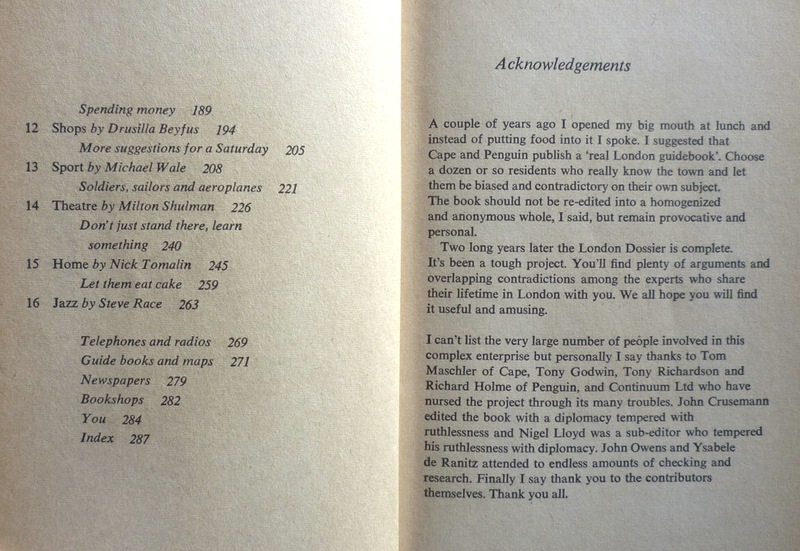 Len Deighton's London Dossier was first published in the UK in 1967 simultaneously by Jonathan Cape – in hardcover – and Penguin – in paperback, which is the edition you can see above. 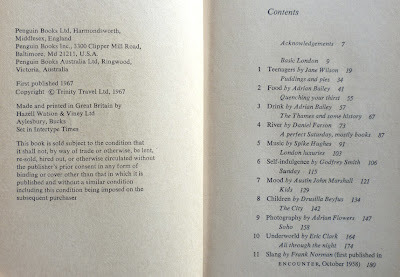 I say "first published", but in fact that should really be "first and only", because those two editions represent the only appearance of the book, which has been out of print for decades. Consequently, London Dossier is in very short supply in either edition: there are no copies at all on Amazon Marketplace at present, and only ten on AbeBooks, only one of those – a Cape hardback – from a UK-based seller. 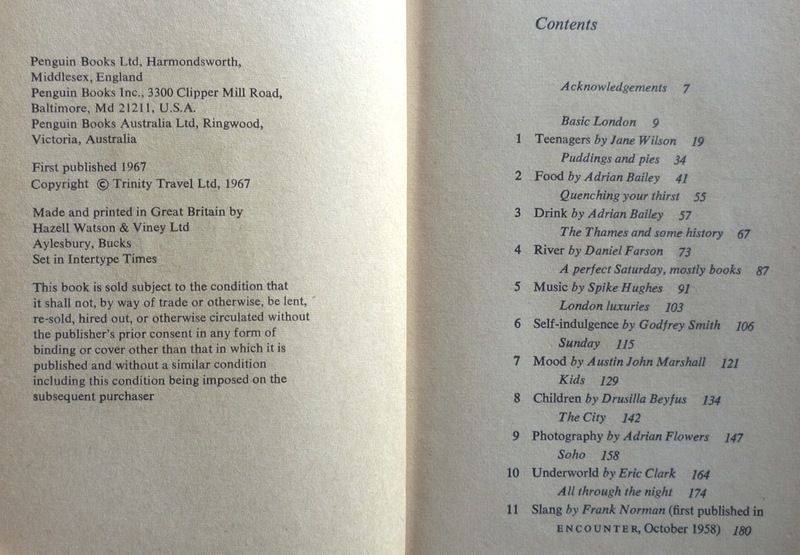 So any Brits wishing to get themselves a copy have a slight problem... although, if you're quick, you could always swoop in on this eBay auction for a Penguin paperback, which ends just before 6.30pm on Tuesday 20 December. 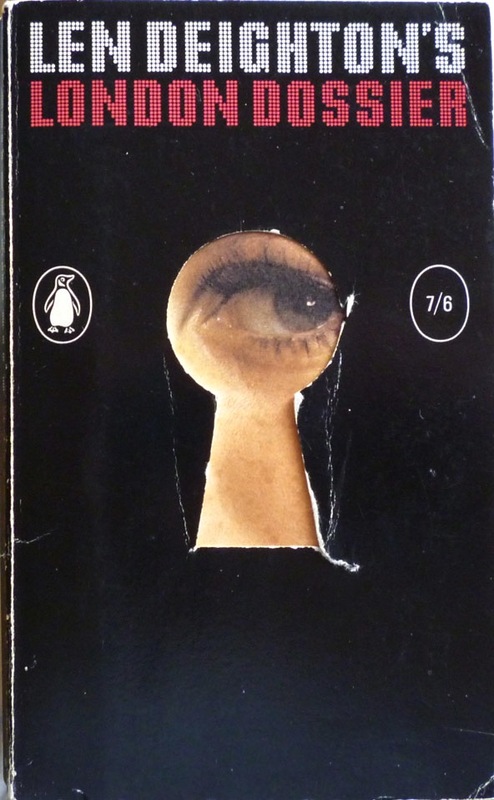 And it is worth getting hold of, not least for the terrific cover, which was designed by Len Deighton's friend, Raymond Hawkey. Hawkey designed the covers of both editions of the book, and while his concoction for the Cape hardback dustjacket, which replicates the notices you'd often find in a public telephone box, is inventive – you can see it on the book's dedicated page on Rob Mallows's Deighton Dossier website – the Penguin cover is, to my mind, equally alluring. 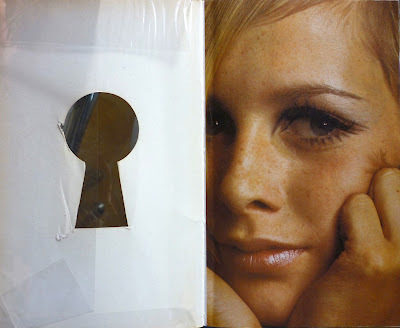 It's actually a double-cover, comprising an outer front cover with a die-cut keyhole, and an inner cover bearing a photo of famed model Twiggy's face, whose left eye peeps through the keyhole. It's an innovative piece of design, and foreshadows Hawkey's slightly later "bullet hole" covers for Coronet's line of Richard Stark "Parker" novels. 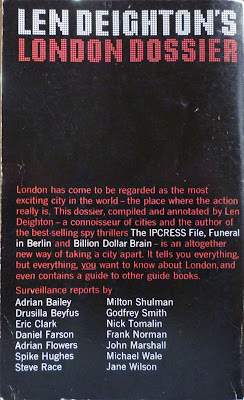 As to the book itself, it's a collection of essays by Deighton and others on London – a kind of tourist guide, if you will. Deighton provides an opening general guide to London – with lots of helpful advice, such as this for umarried couples: "British hotels... (being primarily concerned with the proprieties), prefer you to [book in as] Mr and Mrs even if you are sinning" – and another dozen or so short pieces, sprinkled in amongst essays by the likes of journalist and noted Soho boozer Daniel Farson, photographer Adrian Flowers (who took the cover picture of Twiggy) and thriller author Eric Clark. 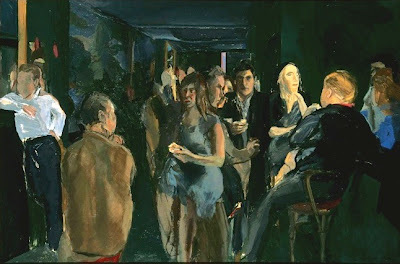 For my part I was pleased to spot mentions of my old Soho haunt The Coach & Horses, as well as The Colony Room – Michael Andrews's evocative 1962 painting of which (part, I recently discovered, of the permanent collection at the Pallant House Gallery in Chichester) can be seen below – both of which were frequented by one of my favourite writers, Jeffrey Bernard (I sat next to him at the bar of the Coach a few times, and saw Peter O'Toole play him in Jeffrey Bernard is Unwell) – that's him in the white shirt on the left of Andrews's painting. See his cover design for the 1963 Pan edition of Ian Fleming's Thunderball. Very true. Forgot to mention that. I'm told that Fleming loved the Thunderball cover... but was rather less keen on the Pan piper logo, calling it the "filthy little Pan sign"! That Pan logo, by the way, was based on a drawing by Mervyn Peake (thanks to Edward Milward-Oliver for that little snippet, and the Fleming one above). 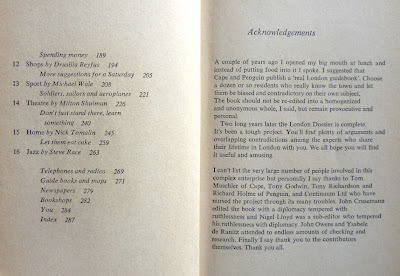 As you are in contact with Edward Milward-Oliver, please ask him when he thinks his Len Deighton biography is likely to be published. 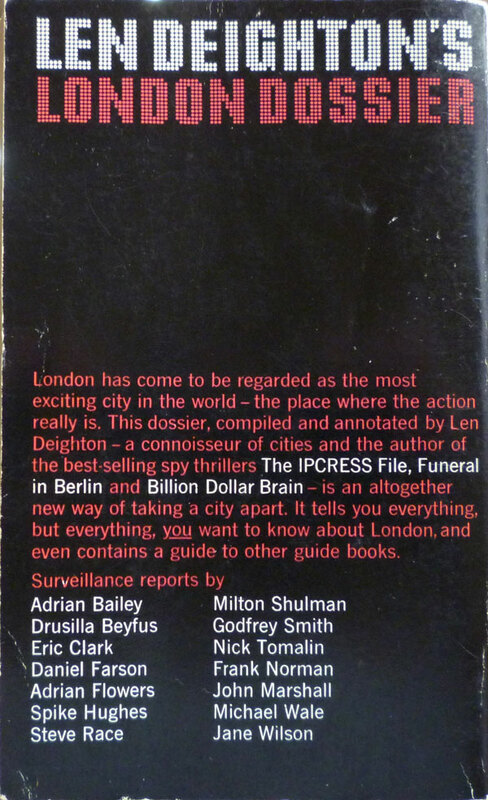 I have the hardcover edition of the London Dossier. Charming book. Having never been to the UK, though, I wonder how badly outdated it is at this point, 44 years after its original publication? I'm sure some of it is still applicable, but do London cabbies and hotel staff still behave as the book describes, for example? Craig: well, the public transport system is still "virtually non-existent after midnight" (unless you're prepared to hazard a night bus, which is an adventure in itself), and stories of taxis not going south of the river still persist – and there is, despite what Mr. Deighton says, some truth in that (unless you happen to chance across my brother-in-law, Ricky, when he's knocking off for the night – he lives south of the river; look out for a blue taxi). Anonymous: Edward Milward-Oliver reports that the biography is still in progress and a publication date will be announced in due course. But Len Deighton has given him unprecedented access, so it should be something quite special when it arrives.